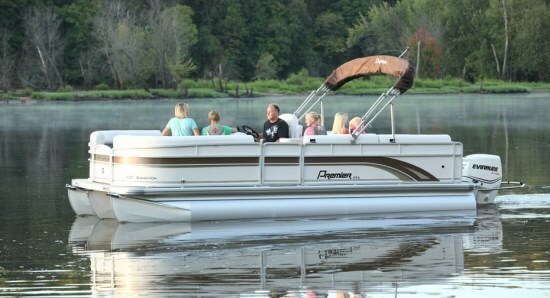 For 2013, Premier offers three series of pontoon boats; Luxury, Touring, and Fish & Cruise from sixteen and a half to thirty-one and a half feet and up to a 10’2” beam. Within those three series are about forty-one models with a staggering choice of about eighty-nine floorplans! The SunSation 220 subject of this review is part of the Touring series. 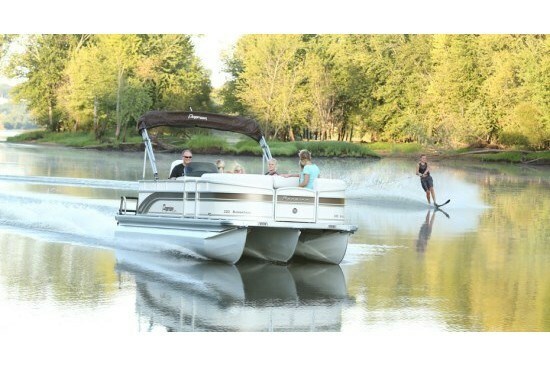 In describing its Touring models, Premier says, “Ski, tube, wakeboard, swim, lounge, entertain, or just tour the lake in style, Premier’s Touring line brings loads of possibilities without the loaded price tag. …Touring models give you the most fun, versatility and value on the water.” There are five SunSation models in two foot length increments from the 160 to the 240 offering a total of about fifteen floorplans in standard RE, or RL, or SL plus the optional DL Group layout. 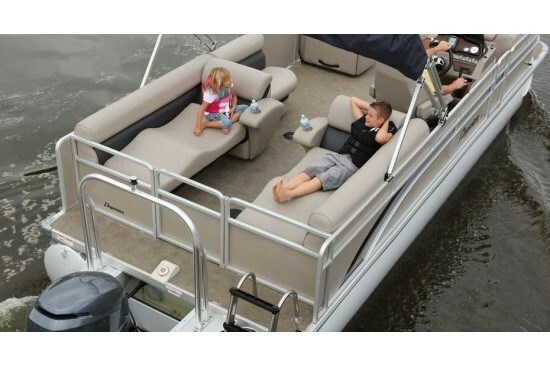 “Ideal for families who want to enjoy the water at an affordable price, the SunSation is the perfect mid-level touring pontoon that’s quality built with an alternate rear-lounge layout.” Let’s explore these layouts. The only common item to all floorplan layouts is the forward portside three-seater bench/lounge seat. Then the standard SunSation 220 RE floorplan layout provides a duplicate of this forward bench/lounge seat facing it on the starboard side. On the aft portside of the standard RE layout is a four seater L-shaped lounge with a circular floor-mounted table. The RL layout substitutes a contoured double sleeper lounge with dividing armrest/drink holder console for the L-shaped lounge. A two-seater bench with ovoid floor-mounted table is ahead of the sleeper lounge and the starboard side helm is moved forward thus changing the forward starboard side three-seater bench to a two-seater. The SL layout is identical to the RL except that the aft double sleeper lounge becomes two single sleeper lounges – one on the port and one on the starboard. With all of the above layouts, the forward port side three-seater bench/lounge seat may be optionally replaced with the DL Group which substitutes two helm-type arm chairs with a fixed triangular table between them. In all cases, storage is supplied beneath all of these standard Premier Signature Series lounges / bench seats. Four boarding gates are standard with every SunSation 220 floorplan layout. Two 25” diameter tubes come standard on the SunSation 220. A third tube is optional. 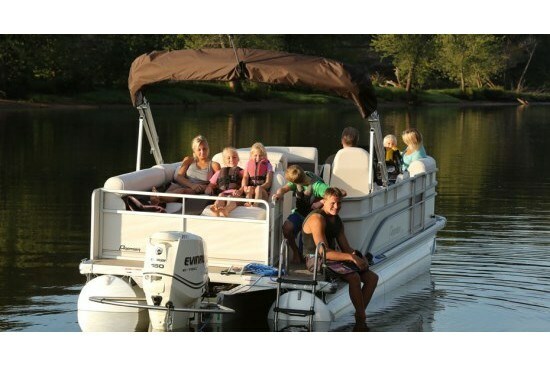 With this third tube, the boat’s carrying capacity is increased by over four hundred pounds, person capacity increased from eleven to fourteen, and horsepower capacity increases from 115 to 175 max. The standard Flexsteel® 5-Star helm chair with armrests faces the Hawk II padded steering wheel and carbon fibre style gauges including tachometer, voltmeter, speedometer, fuel and trim in the standard Spirit I molded helm with tinted windscreen. Also standard is a Humminbird 170 graph depth/fish finder and Jensen MS2013BT Bluetooth equipped stereo with two high performance speakers. Other notable standard features include Durango carpet, port side changing room, 5-step stainless steel boarding ladder, a 9’ bimini top plus a playpen cover. Notable available options include upgraded helm chair, electronics, and bimini top, plus a ski tow bar, BBQ grill, and deluxe cooler table, among many, many other options which may require you some time to absorb them all. You also have your choice of any outboard motor manufacturer from which to choose. Indeed, the incredible choices of sizes and layouts and options available from Premier mean that there is definitely one combination available that can be exactly right for you. In fact, if you move up one SunSation model size to the 240, you can get not only the 30” diameter tubes in Premier’s high performance PTX™ package, but also an “upper deck” with two-storey water slide!